I LOVE Fall ... every single thing about it. I love the colours, the cooler temperatures, the smell in the air ... everything. And it gets even better - this weekend is our Canadian Thanksgiving - so it will be full of family and friends, and a yummy, yummy dinner. I just had to bring a little Fall into the classroom. In anticipation of my favourite season, I decorated my shelves a few weeks ago. If you follow my facebook page, you also know I've been working on some Fall craftivities for my students. 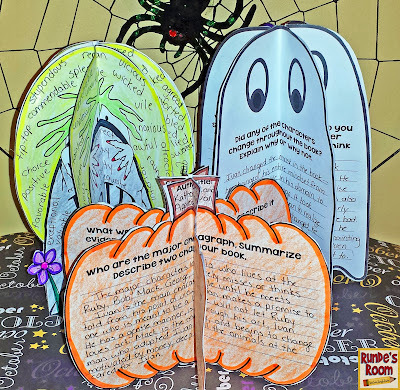 These activities are all literacy based - two of them can be used for book or novel studies (a great non-traditional book report), and the other is perfect for studying synonyms or word choice in writing. Right now we are reading The Worst Best Halloween Ever by Barbara Robinson and working on the Plot Pumpkins. I can't wait until they are all on display in the classroom. I put all three craftivities together in a bundle, but I have also listed them separately in my TPT store. You can take a peek by clicking HERE or on the picture below. 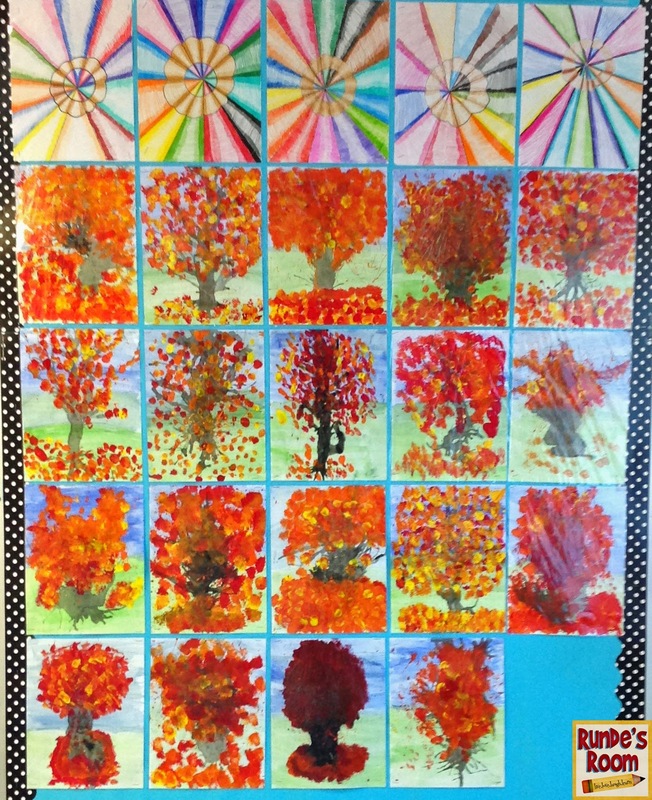 We also brought a little Fall into the classroom with the art project we completed on Thursday. We started with a white sheet of cardstock. 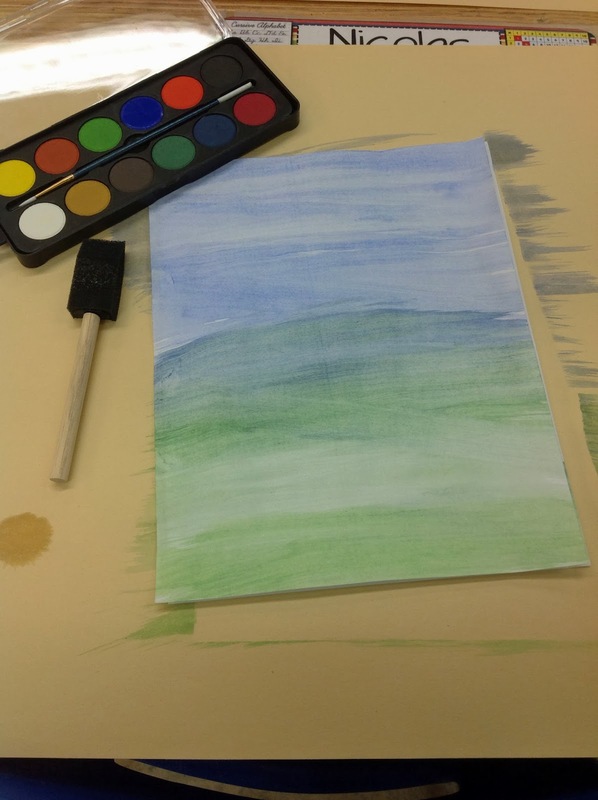 We then used watercolours and foam brushes to paint the background - a wash going from blue to green down the page. 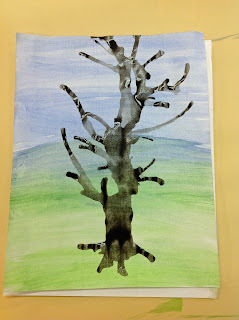 When the paint dried, we then used a watered-down black acrylic paint (about half water / half paint - the consistency of milk) for the trunks. We used the straw blowing-technique to make the trunks. We poured a quarter-sized puddle of black paint near the bottom of the page, and blew into the straw to make the branches and a few roots. 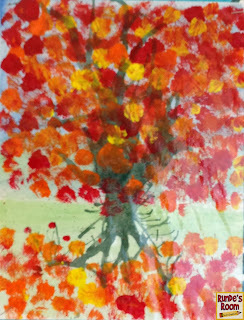 The colour was a little lighter than I had hoped for, but once the leaves were added, it turned out perfectly fine. 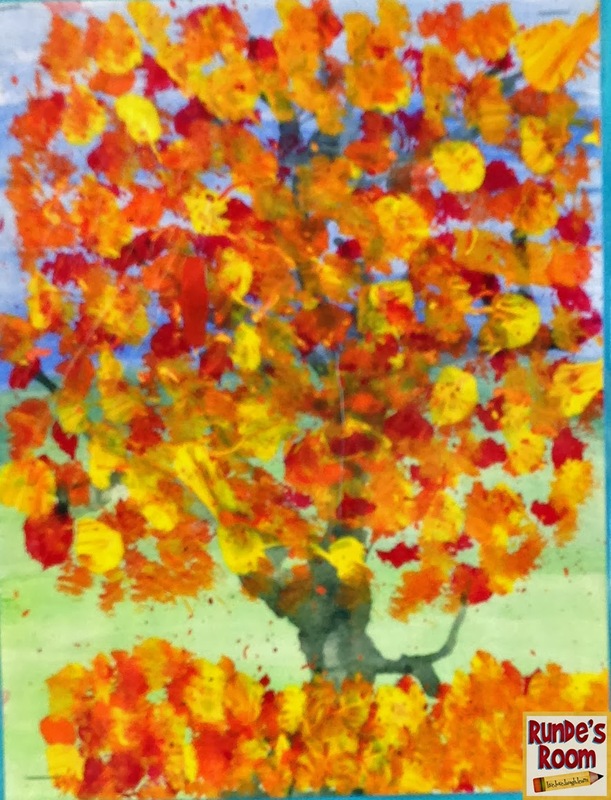 The last step was adding the leaves. We used bristle brushes and acrylic paint in red, yellow, and orange. Students simply dotted and "smooshed" the brush in different directions, layering the colours to create the leaves. The overall effect was quite "leaf-like". :) LOVE them. A few people have asked me why our art projects are always shiny when finished. I like to laminate all our art before I display it (and I always use 8.5 x 11 size paper) because we make a book at the end of the year with all our art and writing from the year. Here are some of our finished Fall trees. I hope you have a terrific weekend! And Happy Thanksgiving to all my Canadian friends!!! I love this! 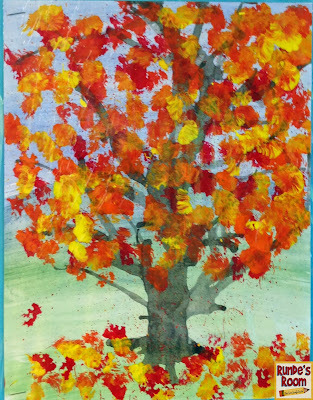 I did q-tip fall trees with my 2nd graders but this looks so much cooler! I'm going to have to try this! Thank you for sharing and happy Canadian Thanksgiving! 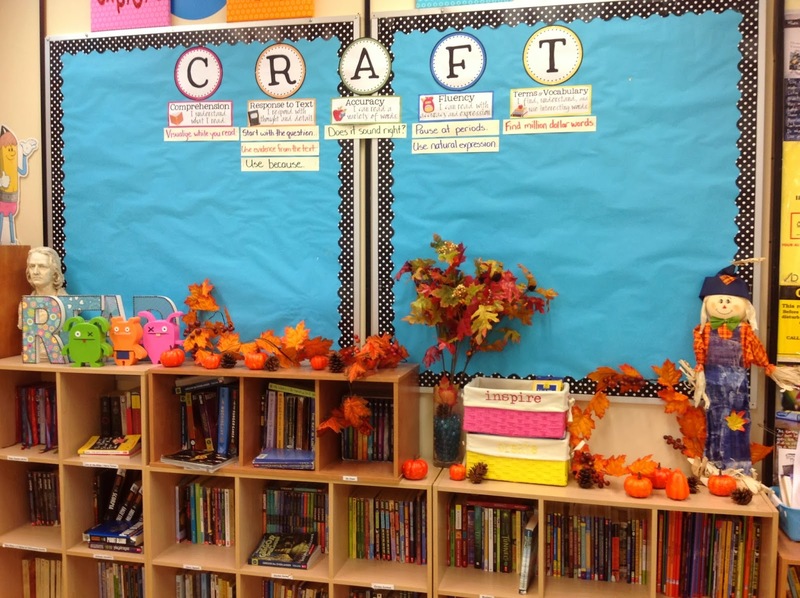 Oo I love your October craftivities! And I may need to check out that halloween book from our library. Enjoy your holiday! Beautiful!! They are simply gorgeous. Thank you for sharing these.. They remind me of the palm tree scene we did for The Night of San Juan. I can't wait to try my own rendition of these beauties! Do your students participate in Silver Birch? I still think it's so cool that you get to teach art to your students! I imagine they love it, and I'm super jealous!! My kids can't wait to try out your fall craftivities next week! Hope you and your family had a fabulous Thanksgiving!